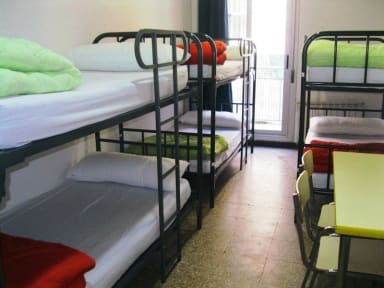 Ideal Youth Hostel i Barcelona, Spanien : Boka nu! Until 30 days before arrival: 10% of the total price from the cancelled reservations. From 29 until 15 days before arrival:20% of the total price from the cancelled reservations. From 14 until 7 days before arrival:	40% of the total price from the cancelled reservations. From 6 until 3 days before arrival:80% of the total price from the cancelled reservations. From 2 until 0 days before arrival: 100% of the total price from the cancelled reservations. Modifications to the original reservation will be subject to availability. Damage which may be caused. This deposit shall be returned as a single sum to the person responsible for the GROUP after the stay and via bank transfer, when the keys have been returned, and when it has been confirmed that no damage has been caused to the facilities. Ideal Youth Hostel is an experienced Hostel located at the Heart of Barcelona City. the most bohemian quarter in the city, is turning into one of the most vibrant, multicultural and cosmopolitan areas! Here you will find real hostel culture. Confortable and well connected for visit the city, near of Liceu Theatre. maximal enjoyment at cheapest prices = FUN!